Hypertension, or high blood pressure, can be very dangerous for a woman who is pregnant. There are two main types of hypertension issues in pregnant women – those who develop it as a part of a condition called preeclampsia or “toxemia” and those who have hypertension before becoming pregnant. A woman who develops preeclampsia needs to work with her obstetrician, sometimes in concert with a perinatologist to determine the best timing of delivery. Preeclampsia can be life-threatening for both the mother and the baby. The mother can have problems, which include seizures, as well as kidney and liver problems. The baby can have problems including too little growth and premature delivery and the associated risks. Both women with preeclampsia and those with pre-existing hypertension can be at an increased risk to require a cesarean section for delivery. They are also at increased risk for abruption, a complication in which the placenta starts to separate from the uterus before the baby is born. This can be life-threatening for both the mother and the baby. 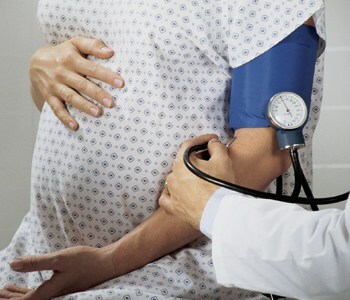 “If you have hypertension, it is important to receive regular prenatal care. Be aware of concerning symptoms. Follow the instructions given by your obstetrician and perinatologist. We want to optimize the outcome for you and your baby,” says Wahl.